Trust is fundamental to any relationship, whether it is business or personal. If there is no trust between partners, things will not run as smoothly as they do when the trust is built and nurtured. However, building trust across cultures, between people who may never meet, or who meet for only a very short time before starting to work together and then must work separately from one another, is a major challenge that is rarely considered when establishing a high performing global virtual team. The big question, of course, is how to build trust across cultures, between people who have been born and grown up in different parts of the world, who see the world through the lens of their own culture and experiences. Fundamentally, as a member of a global virtual team and specifically, as a leader of such a team, it is essential to know how each member of your team conceptualises trust and how they then go on to build trust between cultures. Transactional trust – In this form of trust building, the person building the trust will think “This person is good at their job and has reliably delivered work for me in the past, therefore I trust them” Essentially this person needs to have a working relationship with their virtual colleagues, one where the colleagues can demonstrate that they are capable and able to deliver the required work on time and to the right quality. Only after that will the individual begin to trust their virtual partners. Relational Trust – In this form of trust building, the person building the trust will think “This is a nice person, I enjoyed working with them in the past, therefore I will trust them” In this form of trust building, the individual needs to have a personal relationship with their virtual colleagues, one that is built through spending time together and getting to know one another, before they can start to trust that virtual colleague in a working relationship. “In Group” Trust – In this third form of trust building, the person building the trust will think “This person comes from the same place as I do, we share a lot of common experiences, language and history, therefore I will trust them” In this form of trust building, the individual feels at their most comfortable and trusting when they are working with people who are like themselves, whether that is similar in terms of place of birth, ethnicity, political perspective, socio-economic standing or whatever, once they can identify someone as being like them, from the same “in group” they will begin to trust them. 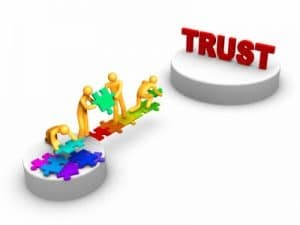 Getting people with similar preferred methods of developing and maintaining trust to begin to trust one another and work well together is relatively simple. If every person on a virtual team establishes trust by transactional experiences, they just need to work together and reliably deliver for one another and the trust will follow. Similarly if they all prefer to build trust through personal relationships, spending time getting to know one another will set them up for a productive working future. However, getting people with different preferred ways of building trust to build a trusting relationship is more complex. Those whose default way to build trust is through transactional relationships of consistent and regular delivery will not find it easy to start to trust people who, in their minds, “just want to socialise” instead of getting on with the work. Equally those who need a sense of personal relationship before they can start to work with someone else will struggle with partners who “just want to get on with the work”. As for those who only really feel comfortable working with similar people, they will struggle with both other forms of trust building; they will have difficulty trusting people who simply want to get on with the work as they will not get the opportunity to explore for similarities, while when working with those who build trust through relationships, they will find they are unable to establish a social relationship without first finding some common ground. Regardless of how individuals build and maintain trust, whether transactional, relational or in group, they will all need to be able to trust their virtual colleagues to be able to work effectively together. Getting them to understand the different ways others build trust is definitely the first step along the path, though this can be a difficult first step. The unconscious bias toward a particular way of building trust is a very strong one, it can be hard to appreciate that others build trust differently, so the first thing to do is to make everyone aware that the differences exist, and to ask people to consider what their default approach is. Awareness of differences is critical to any future trust building work that may be undertaken, since without an appreciation that everyone is different, progress is extremely difficult to make. Once personnel are aware of their own and others preferred ways to build trust, the organisation must develop ways to support cross cultural trust building, such as allowing personnel to collaborate in a low risk environment, one where they can spend time building a social relationship, delivering tasks to one another on time and finding those all important common areas of experience, thus allowing every individual from every perspective to get something from the experience. As the team gets more comfortable with delivery, building personal relationships and common views, it will be easier to introduce more demanding tasks that build on this relationship, but it is important to start out with tasks that allow time to build trust along the way. Do you have experiences with building trust in your virtual team environments you would like to share? if so, we would love to hear from you. Ulfire specialises in supporting organisations plan, establish and run high performing virtual teams. We combine extensive practical experience from decades of involvement in virtual teams with current real world academic research into the way members of virtual teams collaborate. Please contact us to discuss ways we can help your business, or sign up using the form below to receive our regular newsletter.